Thank You, Seth Godin! We Agree! You’re certain to have these classes tomorrow. The class will certainly follow the syllabus. There will certainly be a test. If you do well on the test, you will certainly go on to the next year. If you do will on the other test, you’ll certainly get to go to a famous college. We’ve trained people to be certain for years, and then launch them into a culture and an economy where relying on certainty does us almost no good at all. Broken-field running, free range kids, the passionate desire to pick yourself—that seems like a more robust and resilient way to prepare, doesn’t it? 1 – Adults who trust them to do some things on their own. 2 – Neighbors, cops and lawmakers who understand that this is normal, not neglect. As the school year begins (today is Day 1 in New York City) let’s remember that so much education happens when kids are not in school or doing homework. – L.
Seth Grodin, looking ahead, seeing Free-Range Kids succeed! Protocol for a Diaper Change or Open Heart Surgery? 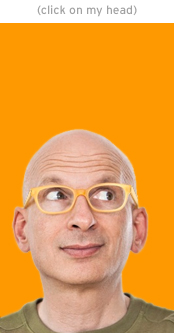 12 Responses to Thank You, Seth Godin! We Agree! Great point. Free-range kids are anti-fragile. Nitpick: Godin, not “Grodin” (take out the ‘r’). If we are diligent about preparing our children for the future, they will prove themselves far more capable than the kids who were helicoptered. That alone will set them up for success. As I’ve discovered, it you’re just a bit above average, you’re well above what the “normal” person can reach. I definitely agree with everything Mr. Godin said; however, today September 8th is the first day of school in New Your City?? Goodness, mid-August was the start of the school year where I live in Alabama. I think I’d prefer going back to school AFTER Labor Day. @theresa, there have always been busybodies, there have not always been kids lock up under constant supervision. Modifying busybodies may seem impossible. But there is only so much a busybody can do on their own. Modify how police and CPS react and you change the impact of busybodies. My husband was just telling me about a police department that changed their online reporting system. They started requiring more detail in order to submit a report. Not too surprisingly the number of reports fell. Perhaps surprisingly they fell dramatically. Almost as if making people really breakdown what they saw made a lot of people decide their report wasn’t worth making. Another upshot was that the number of actionable reports increase. The same can be applied to unattended children, as the new intake procedures in Maryland after the Meitiv’s case. Now alone isn’t enough, they have to be able to articulate actual signs of neglect… ie is the kid seriously filthy, not just play dirt but deep grime? Is the kid behaving erratically, not just walking down the sidewalk near traffic. That sort of thing. And I do think you can modify the busybodies too. A huge number of people believe very deeply that something is morally wrong simply for being “not what you do!” So if you change the standards, the desire of these people to virtue signal will shift in a different direction. The Meitiv case generated a lot of moral outrage over the loss of ordinary childhood freedom. You can see that in the coverage in the Washington Post. And I saw it conversations of a more private nature. When the ‘virtue signalling’ people see that the community as a whole is opposed to children being held prisoner to adult fear, they are going to find some other thing to be outraged about… maybe they’ll be outraged about what we feed our kids, or by babies without hats. Or perhaps, if sending kids to play at the park regains moral prestige and becomes common again, they might even be outraged about people calling the police on a kids walking home from the park. Today I was driving my daughter to middle school. (It was unusual. I don’t usually do that). As I drove through the neighborhood I had to slow down behind a gang of 20 bikes that eventually cut away down a bike path meant to keep kids off the streets. Then I had to wait at a crosswalk while a crossing guard stood in the middle of five lanes of busy traffic while kids on bikes crossed from neighborhoods across the street onto school property. Yellow flashing lights and a wide crosswalk signaled to the busy commuters that they should slow down, and all the kids crossed safely, happily. Probably without even looking. These crosswalks are not always manned, but they are visible enough that I can send my 11 year old to the grocery store across the same sidewalk without a worry in the world because I know my community respects that kids on bikes can/do/and should use that space. Sending my kids out on bikes doesn’t feel like activism or war, it feels as normal as breathing. I love that. I am a free range parent. I do not resent that my community has been built with kids in mind, and I do not resent that my tax dollars pay for things that make it easier for kids to be independent. Is this setup infinitely more safe than what my child would encounter in the heart of a major city without people looking for children? Of course! But does that mean that all of the investment is training my child to just expect the world to conform to her – no way! I am proud that my community cares enough about kids to consider not only their safety, but their autonomy and freedom as humans too. I’m glad we have worked so hard to help kids inhabit their community safely. I guess that is why I disagree only a little bit with Seth Godin’s article. It implies that the classroom is the problem. It honestly reads like ‘worst first’ thinking to me. The classroom is not the stumbling block that kids face in this country. It’s the yahoos who are miles away from the schools trying to fence in the damn things like prisons or defund them in the interest of “better” for profit schools. As I’m volunteering at my kids schools I see that all of those clear expectations and patterns are an important part of enabling kids to take charge of their own learning and excel. And they are actually learning so many valuable skills. 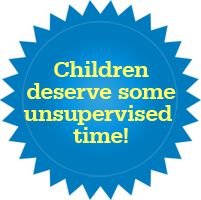 Having the same schedule every A day and B day, the same teachers, the same routine – maybe that’s not how life works – but it IS a great set up for helping kids learn how to exercise independence and good judgement within a low-stakes environment. It gives them a safe place and way to practice decision making. While my job doesn’t give me clear expectations and defined outcomes like a syllabus, the experience of working within that scaffolding has been a huge benefit in my adult life in knowing what to do when I am asked to tackle a humongous problem. It’s a starting place, a methodology that was modeled in school for breaking big things into little pieces and forging ahead. Real life doesn’t dole out gold stars of course, but all those gold stars in school are really about teaching kids how to get things done – how to face the fear of failure or how to ask for help when you don’t understand. Those are really big life lessons to conquer – having a middle schooler reminds me once more what important lessons they were. Call me crazy, but I do believe our educators know what they are doing. In fact, whining that public education hasn’t done enough to prepare me to deal with losing a job or finding my field shifting seems silly. Really? Now teachers need to do that too? Fact: we are all going to die. Should every public school have a seminar on that so that we don’t have to feel uncomfortable or sad when we lose a loved one or have to confront our own death? My opinion may be shaded by the fact I live in a state that seems to want to privatize public education, busted all the unions, and generally does not respect teachers or fund public education. But I just think some things in life aren’t going to be comfortable. I’m okay with that. I am comfortable with the possibility that even after getting a public education, my kids might grow up and one day say “Oh my God. It’s all a sham. I have just realized I have no clue what I’m doing”. Truly, if all my kids get out of public school is the ability to write a decent paragraph and do Algebra with confidence, I’m good. Thankfully there are 18 other hours in every day for them to learn how to cope with a life that isn’t certain or defined. Or take up Cello. Or whatever it is that might be their dream or passion. That got ranty at the end. Sorry for my cray. Yes forcing the busybodies to realize not a big deal is lovely idea but for some reason police and cps keep insisting on saving kids from nothing. Maybe one day it will change if we realize what’s important. Right now common core not age apporite. A love of tests that may not show anything important. And kids are given a horrible time if they try to be without mom or even for a few miminutes. And if you cps and cops to please stop trying save the day when it doesn’t need it they say have to respond to every call. Which anyone with an ounce of common sense can tell you that resources don’t go to real problems. Havva, that is fascinating about the police reporting system. Sometimes, when you’re hearing yourself state the facts, you look at them a little differently. And kids, like every other kids in past generations, change their minds as they get older and more experienced. What we enjoyed doing at age 4, is no longer interesting by age 10. What we found great at age 10, is no longer appealing by 15. And what we understood and believed changes periodically until we reach our late 20’s. So to make children believe that what they do now, is what they’ll be doing 10-15 years from now, is like saying you’ll never grow old. It’s just not going to happen. And if not conditioned properly, they will be ill equipped as they reach their young adulthood. We see it as clear as day. The spoiled, enabled, and entitled adults. Learning adaptability and resiliency seem like better goals than high SAT scores. You can’t enroll your kid in a self-esteem prep course. They need to learn to do things on their own, especially what it is they enjoy doing. All kids are different. Did anyone see the back to school picture of two kids, one had a sign that said “It’s my first day of Kindergarten!” and the other boy held a sign (he wasn’t smiling) that said,”I hate school and I wanted my sign to say that”. Not all children find their passion in traditional schooling. Give them the ability to explore their passions. Giving our kids control over your own life (and parenting to support their dreams) reduces so much of the conflicts in our family. You’re on you’re own, Kiddo!